Tequila Sunrise is a beautifully updated three bedroom ocean front condo at Pelican Watch in Carolina Beach. This second floor unit has amazing views of the ocean and the pool. The modern kitchen features granite countertops and is well stocked for all of your vacation needs. The dining table seats four, with room for two additional diners at the bar. The living room has plenty of seats, and one of the couches folds out into a sleeper. The master bedroom features a queen bed and beautifully tiled master bathroom. The second bedroom with a queen bed and third bedroom with two twins share another bathroom. 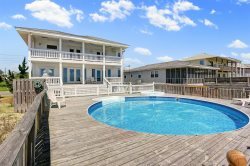 Pelican Watch has an outdoor pool, indoor pool, and hot tub, as well as a private walkway to the beach. You MUST arrive on your check in day prior to 9:30pm in order to access the building. If you arrive later than 9:30pm you will not be able to enter the building until the next morning.